Michigan State University knows what it means to live up to its title as the state university of Michigan. Never has that been more clear than the past few weeks. The most recent example was classic in its simplicity and effectiveness. This year, MSU added a "silver lining" decal - literally a silver-colored outline of the state of Michigan - to the back of its football helmets. 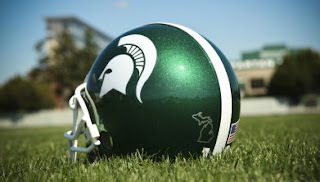 The move was suggested by Coach Mark Dantonio as a way to show solidarity with a state that is ailing economically. The idea started with MSU trying to support the auto industry, but evolved into what you see in the picture (at left). It was a nice gesture, sure, but it would be just a symbol unless MSU backed it up with actions. Like, for example, how MSU officials waived General Motors' sponsorship fees for the 2009/10 season and allowed the ailing automaker to sponsor the Spartans for free. "GM has been a tremendous partner over the years and has provided millions of dollars in sponsorship revenue that helped to support MSU's 750-plus student-athletes, who annually participate in 25 intercollegiate sports," Athletic Director Mark Hollis said in a statement. "We wanted to show our appreciation and loyalty by assisting GM through this critical juncture." The move is a similar gesture to one made earlier this year by the Detroit Tigers, which waived its fees for GM, Ford and Chrysler to sponsor the center field fountains at Comerica Park through the 2009 season. But perhaps the biggest recent gift to the state of Michigan was when MSU signed a deal to play a total of 12 games over the next ten years against Central, Western and Eastern Michigan. The move will save all four universities a ton of money in travel fees and keep all monies from those early-season games in the state of Michigan. The deal represents millions of dollars to Michigan hotels, restaurants, gas stations, retail stores selling fan gear, etc. And let's not forget how MSU's basketball team embraced the city of Detroit - while Detroit embraced Tom Izzo's boys right back - on their magical run to the national championship game. Now, Michigan fans might find the title of this post a bit inflammatory. I don't think so, and I'll tell you why not. The University of Michigan hasn't made any similar gestures. They certainly haven't given any ailing Michigan company a free sponsorship package. And given the chance, Michigan decided they didn't want any part of the Celebrate the State football series with the Directional Michigan schools. That's their decision, of course, just as it's their call as to how to run their own athletic department. Michigan State, however, has taken the lead in standing up for the state of Michigan, which has had more than its fair share of problems of late. That's what a state university should do, and that's why MSU is the real state university of Michigan. I was browsing the web when I found your web site. I wanted to ask if you would please consider placing a link to my website called S & T Sports Fan Outlet? We offer fan gear such as college banners, college flags, logo drinking glasses, sports throw blankets and more. If you think it would be of use to your visitors, would you please consider adding a link to my website on your page. We are happy to offer a 10% discount on sports throw blankets in our team fan shop if you do so. stsportsfanoutlet.com - a one-stop shop for sports fan gear!